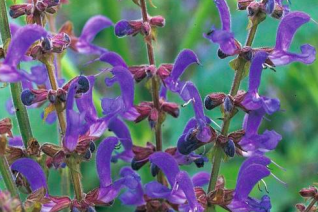 Swamp sage is actually very tolerant of dry to average conditions. 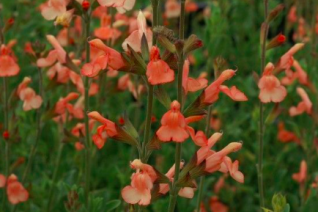 This special sage from South America is surprisingly cold hardy and is a large reliable perennial. 6′ tall wand-like stems terminate in rows of sky blue flowers. There is a white nectary guide on the lower lip. Forms semi-woody clumps that expand at a moderate rate to about 2′ across. Freezes to the ground below about 20ºF but is root hardy near 0ºF. Rich to average soil with regular irrigation through summer. Full sun to very light shade. Blooms appear from early June to early autumn. Excellent in the back of a border or swimming in a sea of large ornamental grass. The medium green leaves are elongated with indentation and rise up along the stem. One of the easiest and showiest of sages. Nice cut flower. Moderate deer resistance. Excellent seedling of ‘Playa Rosa’ with deep clear pink flowers for months and increased cold hardiness. 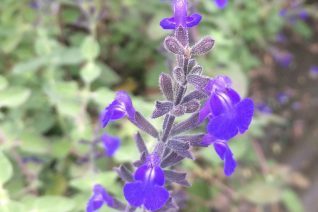 To 20″ x 20″ in a season this is a ‘woody’ sage that forms a small shrub. The vivid pink flowers begin in late May and continue to frost. It takes a break from blooming in extreme heat (above 95ºF) but flowers return when cooler air arrives. Full hot sun to part shade in rich, WELL DRAINED soil. A slope is ideal- especially if it faces south. Light, consistent summer water, speeds growth, establishment and spurs rounds of bloom. Loved by hummingbirds and butterflies. Do not cut back until early spring- when all signs of a hard freeze have passed. It may be cut back hard then and will quickly erupt into a blooming machine. Great in seasonal containers. ‘Rossetto’ is lipstick in Italian. Thanks to my friend Ann Amato for the name. 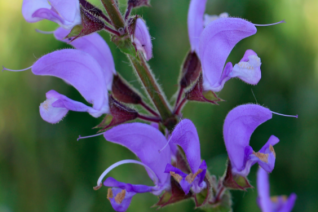 This species of semi-woody Salvia has produced some of the best for our climate. 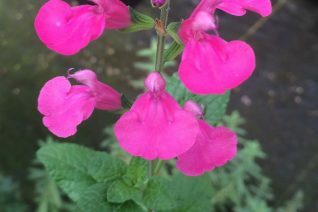 Shocking pink, relatively large flowers decorate the upward stems of this vigorous and long blooming perennial. To 26″ tall and forming a semi-woody shrub. In essence it is a subshrub which is woody with time but capable of freezing to the ground and returning from the base. The vivid flowers appear from May to frost and are a delight for pollinators, hummingbirds and pink-o-philes. Full, hot sun in a warm position in rich, WELL DRAINED SOIL. Double dig the soil before planting to incorporate oxygen and make it easier for water to reach the roots. Do not prune back in spring until you see new growth. Either from the tips or the base depending on how cold the previous winter. Cut back hard then and it will zoom back to its former stature in no time. Hot sunny places, hell strips, containers. Excellent on hot slopes. This species has yielded some very good cold and wet tolerant cultivars. This selection from Monterey Bay Nursery in Watsonville, CA has proved to be one of the best performers. 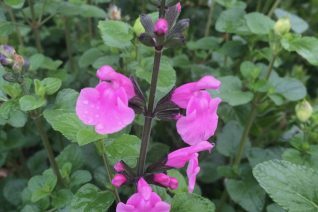 Masses of outward facing candy pink flowers swarm the stems of this large, semi-woody Salvia. The flowers begin in May and continue unabated to frost. This is a very good hue of pink, very mixeable with other colors without clashing. To 2′ tall x 2′ wide in a single season. Well drained soil of rich to average fertility. Double dig the soil before planting to incorporate oxygen and improve drainage as well as water permeability. It excels on slopes in full all day sun with just light summer water. Flowers continue through the hottest weather- good trait in our climate where many others take a break in in the mid to upper 90’s. Drought adapted when established. Do not cut back until new growth emerges in spring- then it can be taken back by 2/3rd. New growth will erupt from semi-woody stems around the base and you are up and running. Herbaceous below about 15ºF. Returns from the base if established. Hummers, butterflies, chicks without bras dancing around like nymphs. Its got it all. Moderate deer resistance. 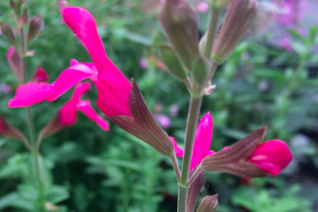 Excellent, cold hardy, easy to grow, showy blue Salvia that can be hard to find. 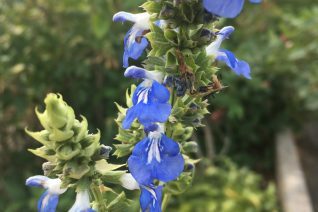 Forms a rosette of large felted deep green leaves and in summer multiple candelabras of rich blue flower spikes appear. They are wonderful for weeks. If you remove spent spikes more will appear. Blooms (re-blooms) until September. Full sun, in rich well drained soil. Rises to 30″ in bloom and forms spreading clumps to as wide in several years. 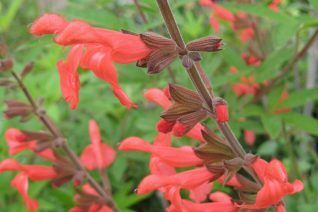 Wonderful border Salvia as it accepts regular water and rich conditions. Completely deciduous in winter. Emerges mid-spring- protect new growth from marauding slugs. Once its up thats much less of a problem. Combine with Lobelia tupa, Kniphofia ‘Lightning Bug’. Easy and spectacular. Loved by hummingbirds and pollinators. Nodding Sage. 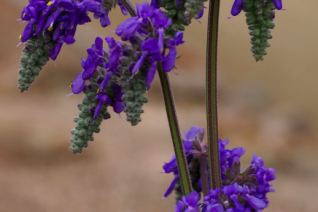 There is no Salvia quite like this remarkable species from the mid-asian steppes. A basal rosette of large leaves supports towering 30″ stems that erupt from the center of leaves. In May-August each stem hosts multiple nodding clumps of extremely showy blue flowers. Elegant, beautiful and hardy. Forms increasing clumps in rich to average well drained soil in full sun to very light shade. Appreciates good drainage and light consistent summer water. The blue flowers are a magnet for pollinators and they swarm en masse. Excellent and groovy cut flower for large arrangements. Otherwise a stellar perennial for borders, even rock gardens. Completely winter deciduous. Blooms a long time. A Xera Plants favorite perennial.